Courtesy of In Style Magazine. 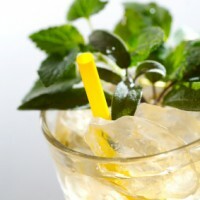 In a large pitcher combine the sugar, mint lemons and cucumber. Add the vodka and lemon juice and let stand for 30 min. Stir to dissolve the sugar, then chill for another 30 min. When ready to serve add the club soda and serve in rocks glasses filled with ice.